« The Mystery of the Apocryphal Einstein Quote…Solved? The podcast I recorded for the 365 Days of Astronomy site is up! As I promised the readers of this blog, here are some supplemental images to go with the audio. To save loading times on the main page, I’ve put the pictures behind the fold. Strong lensing occurs when the gravitation of the lens object bends the light of the source such that the image formed is highly distorted and/or multiplied. The iconic image is the Einstein cross, shown to the right. As described in the audio, the source is a galactic nucleus split into four separate images arranged in a cross pattern around the lens. 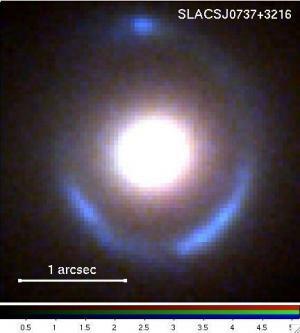 An Einstein ring is perhaps an even more dramatic example, because the image is smeared nearly into a circle around the lens galaxy. In this image, you can see that the there are (to my eyes at least) three images that blur together. 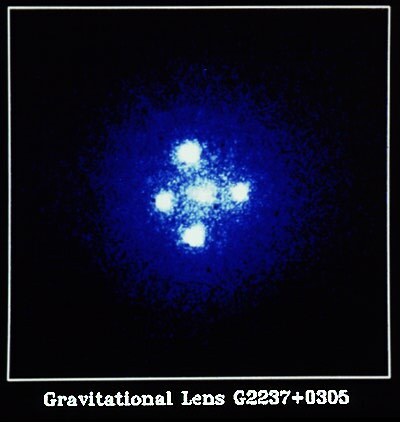 There are far too many examples of strong lensing to include here, so I suggest you do an image search on the phrase “strong gravitational lensing” for more. The stuff you’ll see is really beautiful and exciting. I wrote about the Bullet Cluster in another post, so I’ll send you there for some specifics. 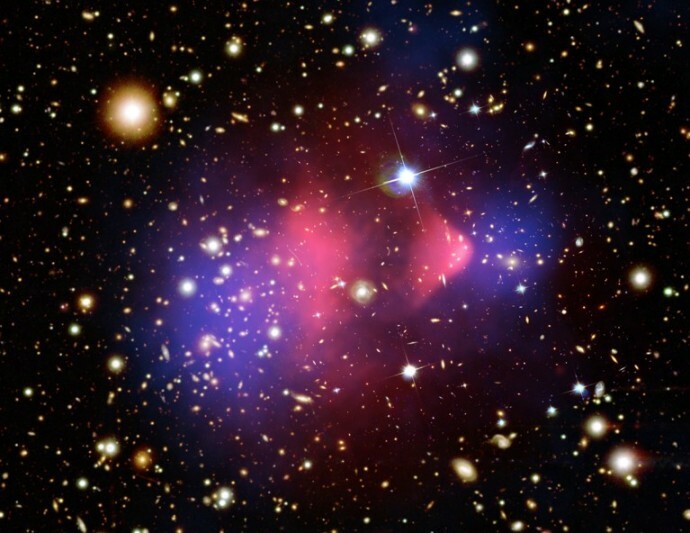 The short version: the image you see here is a composite, where the red is the cluster in X-ray light and the blue is the distribution of dark matter found using weak lensing of the background light, both overlaying the cluster in visible light. You can clearly see the shock wave (the “bullet” itself) of hot gas from where the clusters collided, and the separation between the gas and the dark matter, which is most dense around the galaxies. I borrowed the plot on the right from the European Southern Observatory (ESO); what you are seeing is the amount of light received from the source star (vertical axis) over time (horizontal axis). So, as the lens star passes in front of the source star, the source star appears to brighten due to gravitational microlensing. 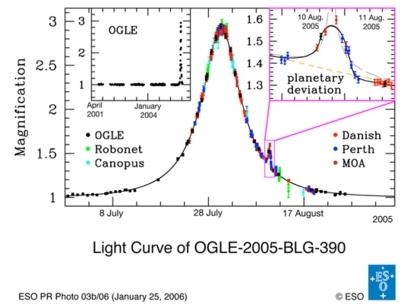 The inset plot shows the extra bit of brightening from the planet orbiting around the lens star — it’s not a very large effect at all! Yet it’s there, and shows how we can use general relativity to detect something we cannot directly image using a telescope.